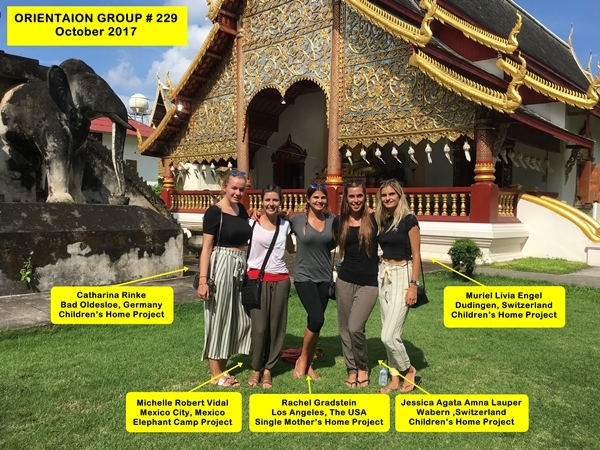 Presenting Chiang Mai Volunteer Group #229! They went through orientation over the weekend and started their projects this past Monday. A group of five volunteers, coming from Germany, Switzerland, Mexico, and the USA. They are participating in our Children’s Home, Single Mother’s Home and Elephant Camp Volunteer Projects. For additional information about our projects, please visit our Projects Page. "Bangkok has been a very new experience for me. A busy, hectic, and hot city, it blasted me out of my comfort zone – and I am truly grateful for it. I feel that my experience being immersed in Thai culture has been both an engaging and enlightening one – being able to experience a brand-new culture in such a hands-on way has taught me the importance of keeping an open mind, staying humble, and the importance of seizing new opportunities. I feel that this trip has really allowed me to grow as an individual."